NEW: Economic forecasts with the Samurai Tarot: July unemployment: If only we could work together to solve this problem, instead of fighting in an election year. 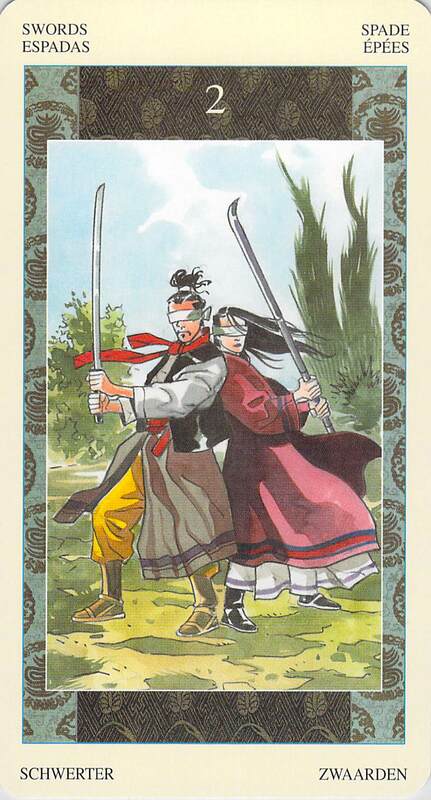 As promised, I will now reveal the second tarot deck that was just given to me by my wonderfully supportive husband: the Samurai Tarot. 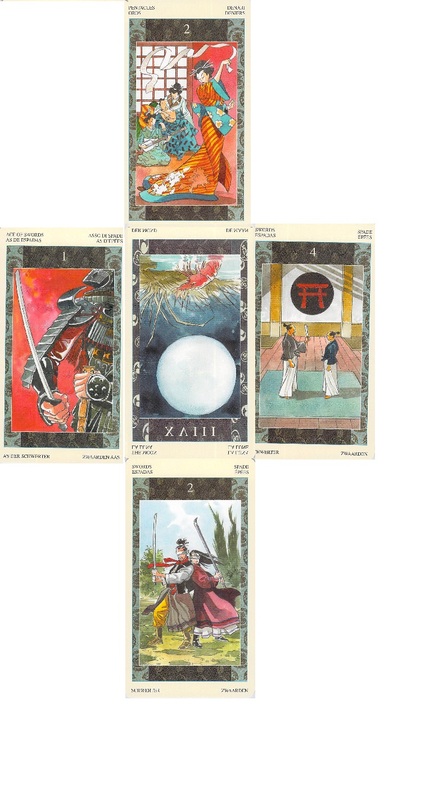 This is a very special deck, and although I’m supposed to be a literature and symbolism wonk, not an economy wonk, these cards are calling out to be used for business and economic forecasts (unless someone makes a special request that I used the Samurai Tarot for another purpose). I decided to try the deck out publicly today (after doing a couple of small business forecasts for clients), testing it on the U.S. July unemployment rate. These cards would normally be laid out in a cross shape, with the first card at the bottom, the second card on the left, the third card on the right, the fourth card at the top, and the last card, the result, in the middle. 1. The beginning: Two of Swords. The two of swords is always a card of choices — choices, when it comes to the economy, that we may not want to make, especially in an election year. One choice stands out with regard to unemployment: Congress’ decision in February not to continue the federal unemployment extension into 2013. This means that workers filing for unemployment for the first time this month can receive, at most (according to several news stories that I checked, but please correct me if I am wrong), 26 weeks of unemployment benefits. 2. The enemies: Ace of Swords. The Ace of Swords represents truth, analysis, and clear-thinking. These attributes, in the politicians and civil servants who foment our public policy, would indeed be enemies of unemployment. I hope that we see plenty of this for the rest of the month. 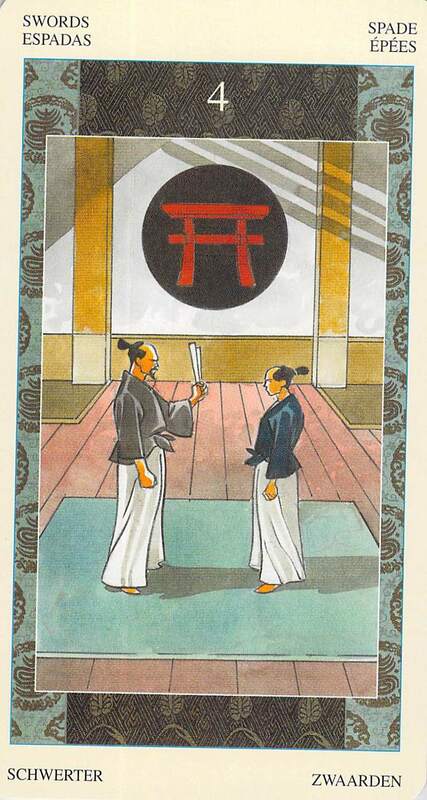 The Samurai Tarot includes this comment in its accompanying book: “Thought — a sword whose true purpose is not to kill but to divide what is important from what is not.” Indeed. 3. The allies: Four of Swords. 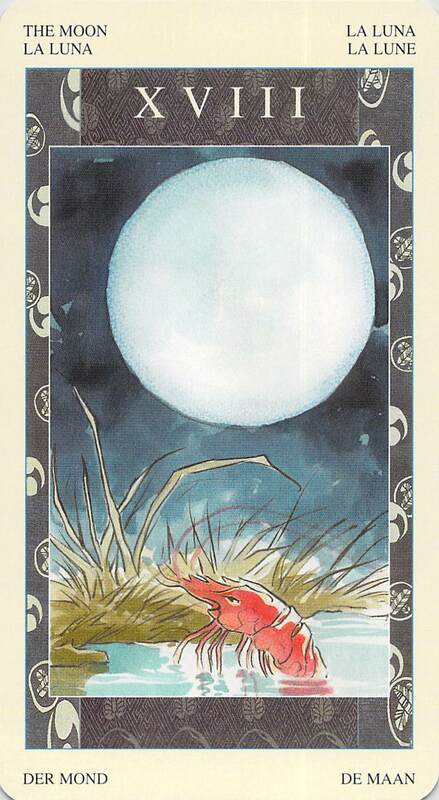 In the Samurai Tarot, the Four of Swords card doesn’t stand for rest, recovery, and contemplation, as it would in an ordinary Rider-Waite style deck. Instead, it stands for teaching. And I think this is correct — education, and focusing constantly on continuing education, is an ally of increased unemployment. I’m NOT against education. I have a master’s degree. I think education is wonderful. But set education against today’s economic context and what do you get? Student debt. Crushing student debt. Well-educated students (maybe) who still can’t earn a living. Liberal arts majors (like me), please comment below: are you working in your field of study? or are you doing something else, something you’ve found that is PRACTICAL? We should be focusing on working together to build a strong economy, and not worrying so much about education, which frankly, is something we aren’t very good at yet in any case. 4. Conflict: Two of Pentacles. 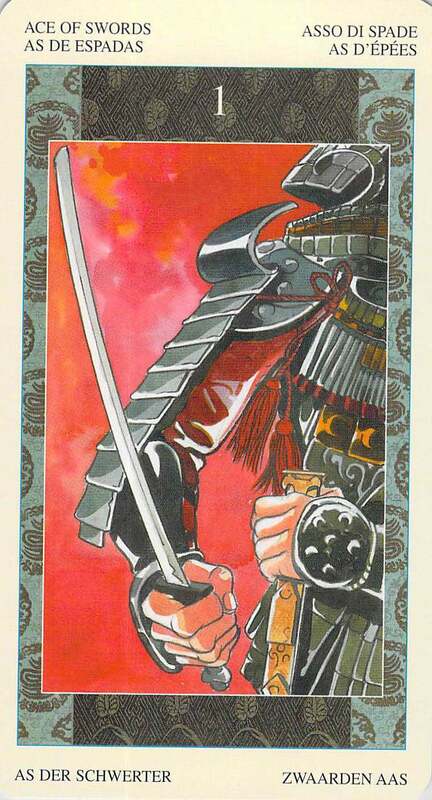 Again, a difference between the Samurai Tarot and the Rider-Waite. 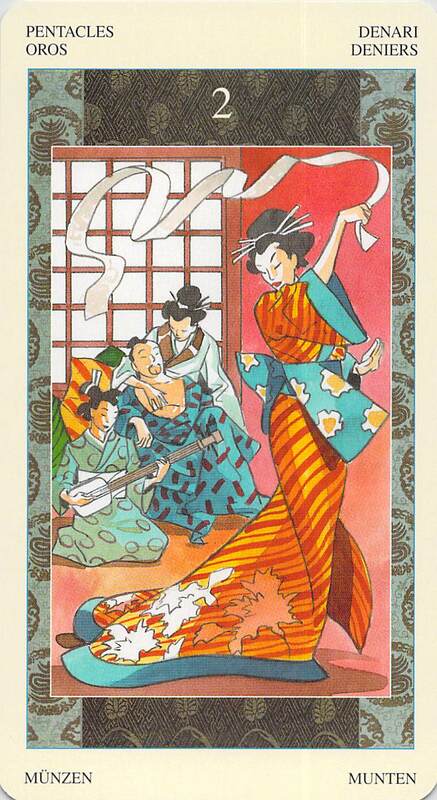 Where the Rider-Waite image for the Two of Pentacles shows a juggler, the Samurai Tarot shows a man of leisure, relaxing and being entertained. While the Two of Pentacles might ordinarily teach us about juggling responsibilities, this is a card about avoiding them — and fiddling while Rome, or in this case Colorado, burns. Is that what Congress is doing this month? You tell me. 5. Result: The Moon Reversed. This could mean a lot of things, but what it means to me in an election year is this crazy result: two political parties fighting each other when what we need most is to work together to build a stronger economy. Our emotions, because of politics and the election, are blocking us from seeing what truly needs to be done. And chaos could be the result. This is a cycle (which makes sense for a position represented by the Moon) that we’ve seen before. It’s a vicious cycle. That said, I’m not trying to produce political commentary, even though my opinions are showing (sorry!). I am just trying to read these cards and unemployment seemed like a good test case. Please share your thoughts below. Previous Cards for the Day: Knaves of Pentacles and Wands: Hesitation. Creative Restlessness. Next Cards for the Day: The Wheel/R’d King of Chalices: Good luck, finally, for divorced dads? I hope so. Fever or no fever, it was fabulous and not confusing, and never apologize for having an awesome blog with great insights! I love to make people’s days!